February 14 is just around the corner. Valentine's Day is not an obligation, but an opportunity to show that special someone you are thinking about them! 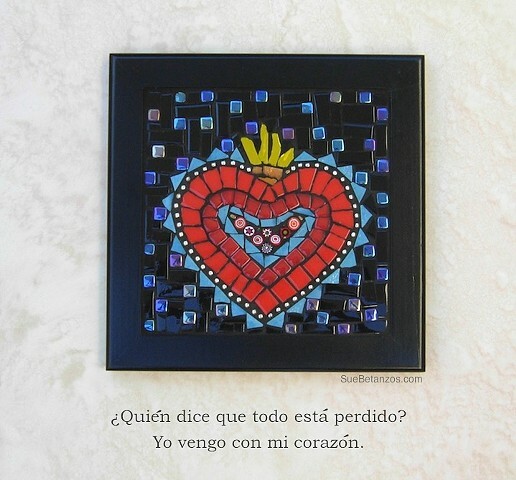 A Milagro Heart mosaic gem. The Spanish quote: "Who says that all is lost? I come with my heart" is perfect for this mosaic gem. Beautiful, this lovely mosaic was designed after the milagros used in religious relics. Gold mirror is used in the flames of love, and Italian millefiori glass pieces are used in the center of the heart. Iridescent blue black tiles are scattered in the black like a starry night. The Milagros Heart Mosaic will be on display at the Agua Caliente Ranch House Gallery Saturdays and Sundays. I will be at the gallery on the weekends as artist in residence 11 am - 3 pm.